← AfroBeatles: Fela + The Beatles. Yoda is real. Why tablet web? Why not? 6 reasons why tablet web is right for your brand. I’m frequently asked why a brand that is currently seeing their tablet users converting at high rates on a non-tablet optimized website, should invest in optimizing their site for tablets. As many online retailers are starting to see the ranks of tablet customers swell in their online user base, this conversation of tablet web optimization begins to take on added significance. An Adobe Digital Index Report issued last year reinforced the fact that tablets are providing online retailers new opportunities to engage customers in shopping experiences that are extending engagement, conversion, loyalty and retention. As the WWDC keynote yesterday pointed out, many brands are seeing higher rates of conversion on tablets than on PCs. As such, tablets are becoming an increasingly important component of the e-commerce toolkit for brands and businesses. My response to the “why” question is usually long-winded and rambling. Me? Long winded and rambling? Nooooo. So I’ve decided to collect my thoughts and offer them here. It was originally going to be 10 Reasons, but I started to lose steam after 5. 1. Form and function. The truth of the matter is that desktop sites were not designed for tablet use. The navigation for a desktop site and that of a tablet are different. The desktop relies on a mouse for point and click, while a tablet relies on a finger or stylus. While a user can select items using their finger on a desktop site from a tablet, it’s not as fluid and is more often than not frustrating. This frustration (of users attempting to select items on your site that are too small or poorly spaced) can be avoided entirely if your site is optimized for use on a tablet. 2. Tablets are for touching. One of the primary benefits of a tablet experience is the ability to touch the screen to access and manipulate content. 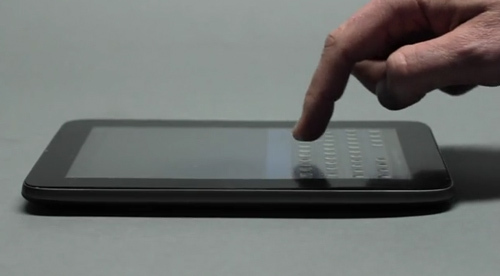 A desktop site accessed from a tablet loses much of the ability to engage a visitor with tactile interaction. A tablet web site that incorporates standard gesturing into the user’s experience can enhance the overall interactivity of that experience and enables a user to easily access content elements. A site which a user cannot swipe through to see additional items, easily access menus, pinch, zoom, rotate or otherwise manipulate the screen (the way they can with native applications) significantly detracts from the inherent fluidity of tablet navigation. 3. Reduce clutter. The desktop site contains multiple levels of content designed for consumption on a PC. The best tablet web sites are designed in such a way as to remove clutter and reduce distractions. Each screen focuses on a core user task or piece of content, leaving a simplified experience for the user. Menus are tucked away or vanish when not being used, banners and ads cede to the more functional elements of the user experience. 4. 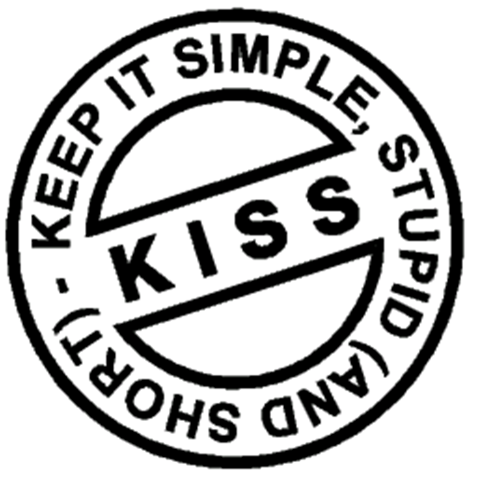 KISS (Keep It Simple Stupid). Well designed tablet optimized sites provide utility with simplicity. Navigation is clean and intuitive with navigation elements that are easy to find. Simple design tends to enhance, rather than distract from, the user experience. By making it easy to move about your site, reducing the number of steps required to access desired content (without having to rely on clunky and distracting breadcrumbs or other extraneous navigation elements) you’re enhancing the user’s ability to interact with your brand and convert. 5. Less is more. Most websites are extremely complex jam-packed with content. This complexity rarely translates well into a mobile or tablet environment. In contrast mobile sites are built with simplicity in mind. There are fewer options, with only the core elements available to the user. Tablet websites should adopt the simple form of mobile, while simultaneously taking advantage of the larger form factor available to present content. 6. Reduce white space. On a tablet, space is at a premium. Unlike the desktop, where users are used to seeing empty spaces, tablets are designed with as little empty space as possible. Since the majority of what tablet owners do with their devices is shop, eliminating white space and utilizing that space for some functional feature or page element (larger PDPs, compelling CTAs, or special offers) is key. Ultimately, whether you make the leap to tablet optimized web goes to how you value your customers. While they can use your desktop site from their tablets, they shouldn’t have to. More importantly, you shouldn’t want them to. You should want your users’ experience with your online properties to be optimized for the device they are consuming them from. To be clear, in my opinion a native tablet app provides the best user experience, but if you’re testing the waters, then a tablet optimized web experience is the way to go. In this age of tablets and mobile technology, optimization should be every brand’s highest priority. Since my previous comment, the industry has again proved me right. New frameworks now exist that deliver full immersive 3D native-like UI experiences. For those arriving late to this post, please check out the famous framework. It will help you deliver feature and content rich applications that feel native. Title: My view on web and native. How right you are! Another thing to note, while native apps absolutely DO give the best overall user experience, there is definitely nothing lacking in the web area for technology. Slowly but surely, HTML5 and Webkit technologies have gone from a standstill to an absolutely amazing and usable technology in the past few years. Heck, we can develop near native full 3D games via web browser now! The reason being is that the hard-core backend developer guys are merging the gap between HTML and computer hardware in a way that makes it easily accessible to web developers. Some of the most fancy web sites fully utilize these technologies and will most likely become more common as the costs of developing web versus developing native apps (for more than one device. ie. iOS, Android, Windows, etc) is more cost effective. In the end, Code once, deploy once – not code each device, deploy all. Conclusion: Perhaps right now the web can’t deliver full performance, however as we see hardware becoming cheaper and faster, theres no reason the web one day won’t be able to deliver speeds relative (if not full) to our native apps. The future lies in the web. Sources: forecast.io, yahoo.com, other tablet friendly sites. One other thing to keep in mind for the developers are use well-known, tried and true methods for developing your website or app. Here are some of the best coding practice advice a 10 year senior developer can give to others. You’re definitely on the inside when it comes to these discussions, so you know more than the average Joe about the improvements in web technology, HTML5 and responsive design that will make much of these debates moot. But for now, it’s important for folks to acknowledge the strengths and limitations of these technologies. And to understand user expectations about how things should behave considering where mobile web technology is today. And what is already possible should be delivered. You’re absolutely right! Again.. lol. I sometimes get carried away on this long lived debate about web versus native. One day, I hope it won’t be an issue. In fact, being a product developer I routinely ask myself and other co-workers what the best method is for a certain feature. Whether we should be harnessing native hardware functionality or simply go web app. Good thing that there are current solutions that bridge this gap even more! Just take a look at products like Phonegap. There are MANY more products just like this out there. Back to it, it is definitely, positively, absolutely, defaposalutely important to note the key differences in the technologies, their strengths and weaknesses, and which one will work for what use case. This responsibility doesn’t necessarily fall onto the developer’s shoulders completely either. It’s up to the users to submit feedback and tell the developers THEIR expectations and wants. This is how the industry works! Then, and only then, is it up to the developers to make the decision on which technology to use. Until then, be prepared to see a lot of sketchy stuff. Most of it unusable until it becomes stable and mainstream. Again, right there is the technological bottleneck. Dynamic webpage technologies could of existed 5+ years before they did if browser cross compatibility were up to standards like they should of been. But that’s another topic completely. Until next time, keeping waving your wands boys! i wonder who inspired this post? You did Dianne! It was you! You are my blog’s muse.